The Tante Ju (“Auntie Ju”) was the main workhorse of the Luftwaffe transport units for the duration of the war. It was intended as a replacement for the highly successful W 33 and W 34 transports of 1927, and planned from that time as an enlarged version of the same basic design concept with the stressed, corrugated metal skin characteristic of Junkers aircraft. It first flew in prototype form during October 1930 with one 541kW (725hp) BMW VII Vee engine. The Ju 52a to Ju 52d initial production models for the civil market differed only in the type of engine used, but with the Ju 52/3m a three-engined powerplant was introduced for greater payload and performance. Most early Ju 52/3m versions were 15- to 17-seat passenger airliners which sold all over the world, at one time making up 75 per cent of the Lufthansa fleet. 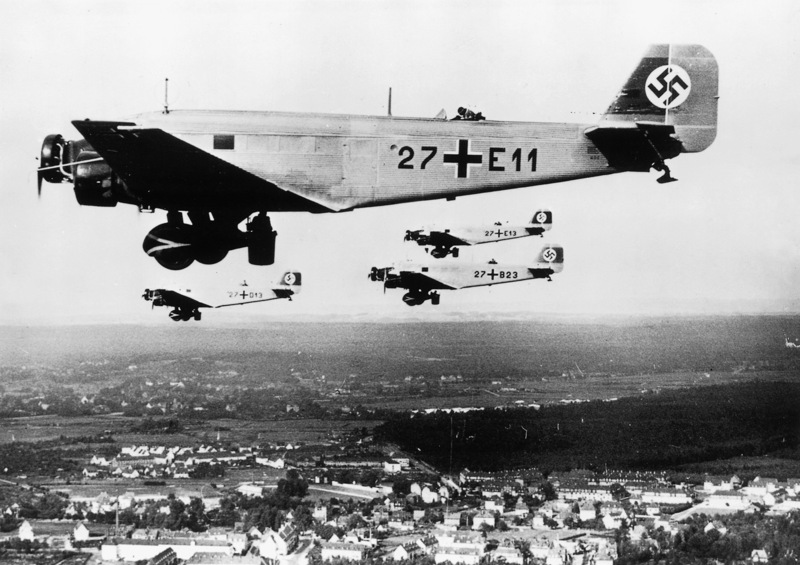 In 1935 the Ju 52/3mg3e bomber, with manually aimed MG 15s in a dorsal cockpit and ventral dustbin, and a bomb load of 1500kg (3307lb) equipped the first Luftwaffe bombing squadron, but nearly all of the 4850 aircraft built – the vast majority of them to meet military orders in variants between the Ju 52/3m ge and the Ju 52/3mg14e – were equipped as troop transports, freighters and casualty evacuation aircraft. During World War II it was used in every theatre through to May 1945.